All the tones of the original Sparkle Drive plus three custom mods for punchy and modern to thick, singing lead tones! 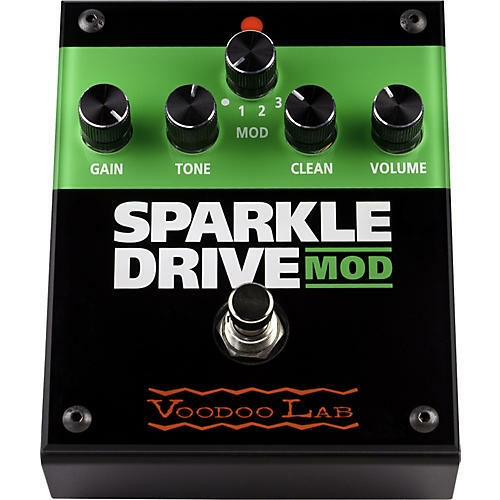 The Sparkle Drive MOD overdrive effects pedal from Voodoo Lab delivers all the overdriven sounds of the original Sparkle Drive but with a twist. Using the MOD switch, you can select the stock 808-based circuit or instantly pick from three custom mods. Whether you need more gain, tighter bass response, a more-vocal midrange, or a thick and juicy lead tone, Sparkle Drive MOD gives you the tools to get there. In Stock mode, you get the classic tube-style midrange grind that's great for blues or for boosting your solos. Mod 1 is the Lead circuit with extra gain, a thick and juicy bottom end, and smooth highs that are perfect for single-note melodies. Mod 2 delivers punchy, mid-cut rhythm tones thata re great for chunky rock power chords and funk. Mod 3 gives you the high-gain treatment with articulate highs and an aggressive bottom end. Additional features include a unique Clean control that allows you to blend in a boosted direct signal restoring attack and feel. Switching is true bypass via a high-reliability gold-contact relay. Maximize your overdrive. Order the Sparkle Drive MOD today.